Our range of products include colorful jar mixer grinder. 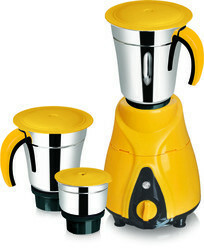 We have gained expertise in offering a quality approved range of Colorful Jar Mixer Grinder. We provide this products with advanced ventilation system for enhanced motor life. Offered range of product is tested for its quality under the supervision of highly experienced and skilled quality experts before introducing in the market. Moreover, our clients can avail these products at reasonable market price from us.